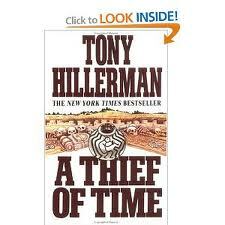 Today’s book is A Thief of Time by Tony Hillerman. Many of you may be familiar with Hillerman’s novels, but if you are not I will give you a bit of background. Hillerman was a best-selling mystery writer who set many of his most famous mysteries among the Navajo (Dine) people. Hillerman was widely praised over the years for the way that he (a white man) was able to depict the world of the Dine and life on and off the reservation. Hillerman’s work is great mystery writing, but really it is a fantastic glimpse into Dine life. So A Thief of Time begins with the disappearance of an anthropologist who was studying Anasazi (the ancient cliff dwellers of the Southwest whose culture remains mysterious for anthropologists and historians) pot shards. Her disappearance eventually is linked the murders of three people who, in some way or another, were involved in her search for pottery at different sites on the reservation. Drawn into the investigation because of its complexity is Lt. Joe Leaphorn who is considering retirement after the sudden death of his wife, and the young tribal policeman Jim Chee. But the plot is not really the reason to read the novel– the reason is the way Hillerman depicts Dine culture and the landscape. The tiny, but essential details in describing the Anasazi ruins, the remote hogans, and the trailer (complete with rain barrels and tires on top) of Officer Chee. If you have ever been up to the Four Corners area, you realize that Hillerman’s descriptions of the rutted, unpaved roads and the desolate canyons are spot on. But it is not just the descriptions that are correct, but also Hillerman’s understanding of Dine culture– like how traditionalists don’t like the white man’s custom of the handshake (usually they will offer only the briefest of one), or how they tend to nickname people by their physical characteristics, or how silence, for them is a respectful way to allow a speaker to finish a story, whereas asking questions is considered uncouth. Hillerman also had an impressive grasp on the varieties of religions that the Dine adhere too– those who are on the Jesus Road, the Peyote Way, the Blessing Way, witchcraft and those who just sort of ignore it all. The books are rich in understanding of the Dine way of life, and it is these little cultural nuances and understandings that lead Leaphorn and Chee to solve the mystery. 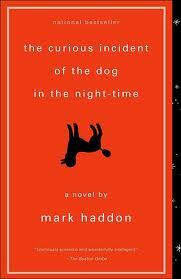 This evening I finished Mark Haddon’s The Curious Incident of the Dog in the Night-time, recommended to me by a good friend. I can honestly say it’s unlike any other book I’ve ever read, and in a good way. Haddon tells the story from the perspective of Christopher John Francis Boone, a 15-year-old boy with autism (actually, the book doesn’t specify what his behavioral problem is), which makes for an unusual and fascinating style: lots of stream-of-consciousness, lots of digressions, lots of literalism. The story begins with a murder – well, to Christopher’s mind it’s a murder. To others it’s simply the unfortunate killing of a dog, specifically the neighbor’s pet poodle Wellington. Puzzled by the incident and fascinated with Sherlock Holmes, Christopher takes up the role of detective to discover who killed poor Wellington. At first, the book seems like an unconventional murder mystery. The reader is lead to believe that the point of the book is for Christopher to solve the mystery, and the first half of the story lives up to this expectation. Christopher investigates (as best he can given his condition and his fear of strangers), looks for clues, and makes deductions, often with airtight logic. Eventually Christopher’s father discovers his extracurricular activity and orders him to stop his investigation. At this point the story takes an unexpected turn, as Christopher discovers information that throws him into confusion and calls into question his trust in his father. Too frightened to stay at home, he sneaks out of the house in search of a new place to live. His search sets him on a daunting journey longer than any he has ever taken by himself. The trek involves overcoming some of his greatest fears: crowded places, loud noises, talking to strangers, using public toilets. Through it all he perseveres and reaches his goal, only to find his new home is no better or safer than the one he left in fear. Without giving away the ending, I will say that it is a happy one without lapsing into sentimentality. Curious Incident is a remarkable book. The (authoritative and always reliable) Wikipedia notes that Haddon did no research on autism or Asperger’s syndrome for the book, nor does he consider himself an expert on the subject. In fact, he regrets that the term “Asperger’s syndrome” appeared on the cover. Nevertheless, the book paints a vivid and realistic picture of the mind of an autistic child, at least based on the very little experience I have had with the condition. Christopher fixates on things most people ignore, which makes him much more aware of his surroundings, but at the same time makes his life much more complicated. He is uncomfortable with human contact, to the point of screaming if a stranger touches him. Because of his fixation, however, he can also do things that baffle most “ordinary” people. He knows all the prime numbers up to 7,057. He can solve complex math problems – he even prepares to take the A levels math exam, an important element in the story. He can beat most people at chess and quickly calculate the probabilities of various outcomes in a game of chance. Another interesting aspect of the story is Christopher’s reflections on language. He doesn’t like metaphors because they are “lies,” whereas similes are acceptable. He doesn’t completely understand why words like “spazzer” are unacceptable, when kids can make the accurate word “special needs” into an insult. An apocryphal story is simply a lie, because it describes something that didn’t happen. His perspective on the world is strictly black and white, making it difficult, bordering on impossible, for him to lie. The book also opens a window onto the difficulties of raising a special needs child. Despite his mistakes, Christopher’s father comes across as a patient and loving father. The responsibility has clearly taken a toll on his life (as it did on his marriage), but he cares deeply for his son and does whatever he can to protect him, to a fault, as the reader discovers. Curious Incident was a fun read and certainly one I would like to come back to at some point (but not this year :)). If you’d like to learn more about the book, I recommend this interview with Haddon at Powell’s Books. Twelve down, (at least) forty to go.